Click on the button for the Events Calendar at the top of that page. Once the calendar opens, on the bottom right, click the button for "Google Calendar". This will add this calendar and all supporting info to your calendar page if you use Google Calendar. You can then also sync Google Calendar with Outlook, smart phones and other applications. What's so great about this? As meeting locations or topics change- your calendar is automatically updated as we receive the updated details. We also provide a web link to more information for your calendar. The networking calendar remains independent from your personal entries for quick viewing. 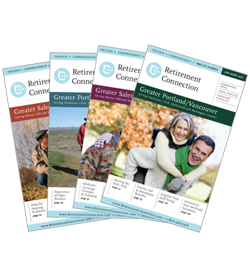 There is less than a month to reserve your ad space for the next Salem edition of Retirement Connection Guide. Reserve space now for 2013.We have made some changes to the guide for our newest edition in Portland and plan to implement these changes with our next Salem edition. April 11 for the Salem Release Party. RSVP today. Retirement Connection is not just an ad- we are an extension of your marketing department: Print, Web, Networking- we are here for you. Reach and out and let us know how better to serve your needs. If you are a Housing, In Home Care or Home Health Care Provider, we encourage you to submit your information using the appropriate form below. Your listing information is included free of charge and we appreciate your help in keeping our guide accurate and up to date. Please complete the form, even if there are no changes- simply check "no changes". Then print and fax the form to 503-238-7501.
and "like" our page to receive weekly reminders about community events, articles, and other announcements for seniors in Oregon. to connect with other referral sources and stay up to date on upcoming professional events, Long Term Care related news, and pictures from events. In this newsletter, you will find information about: networking, CEU training, Event Sponsorship, Web Advertising, and more. Build your referral network with Retirement Connection! The following is a preview of some of the upcoming professional events, check the Professional Events page for complete details and information on other future events. UPDATED DAILY. Visit the Contact Us page, to submit events for posting. Retirement Connection sponsors are invited to join us for breakfast and networking at this exclusive sponsor event. Come hear about upcoming opportunities and ways to make sure you're making the most of your sponsor opportunities. Register by February 19th for the Early Bird Pricing. "The brick walls are there for a reason. The brick walls are not there to keep us out. The brick walls are there to give us a chance to show how badly we want something. Because the brick walls are there to stop the people who don't want it badly enough. They're there to stop the other people." Do you see a barrier as a stop sign or a new challenge?